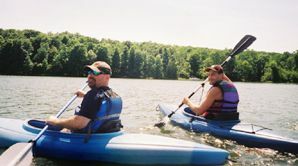 "* adirondack kayaking and canoeing in Upstate New York Resource Travel Guide to attractions, vacation, tourism, resort, hotel, motel, accommodations, lodging, Real Estate, Lake, Travel Guide, lodging, hiking, restaurants, real estate in Upstate New York etc..! " 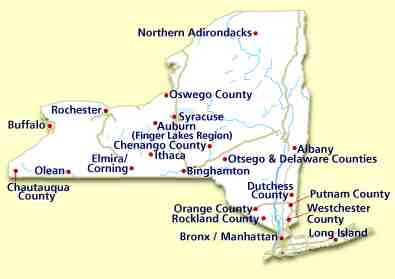 and Visit Upstate NewYork.com network of travel sites. The Adirondack Park and adjacent areas contain thousands of lakes and ponds and hundreds of miles of rivers and streams, including the mountain lake that is the headwaters of the Hudson River. It can be considered one of the nations most valuable resources. Below are some of the more popular routes, though many of the best experiences can still be found by exploration. Saranac Lake, Lower Saranac Lake , Lake Ossetah, Lake Flower and the Saranac River. The route from Upper Saranac Lake to Lake Flower covers around 25 miles. The water flows in a southeastern direction from Upper Saranac Lake to Middle Saranac Lake, which then flows east to Lower Saranac Lake, Oseetah Lake, Saranac River, and north to Lake Flower in the Village of Saranac Lake. The Saranac River then continues until it flows into Lake Champlain in Plattsburgh. The route travels along thousands of acres of "Forever Wild" designated State lands, waterways and beaches. You can paddle the entire chain with only one short portage between Upper Saranac Lake and Middle Saranac Lake. A good starting point is on the north end of Upper Saranac Lake on Back Bay. Paddling south you will pass Dry and Green Islands. Continuing south, Markham Point, Square Bay, and Saginaw Bay, are all on the east shore. Buck Island is at the head of Saginaw Bay. Fish Creek Bay, on the west. Continuing south through The Narrows, the lake opens up again. Birch Point, Eagle Island, Gull Point, Gull Bay, Deer Island and Doctors Island are all landmarks to guide your trip. Chapel Island, located on your right at the southern end of the lake, has summer church services open to the public. 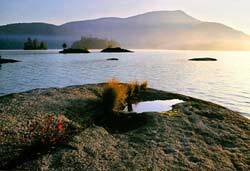 At the south end of the lake, head east into Huckleberry Bay and look for signs marking Bartlett Carry. 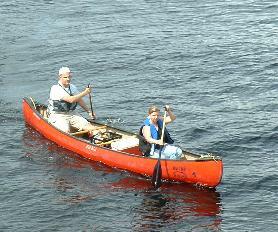 This is the only portage on this journey and is a short walk to Middle Saranac Lake. Head East across Middle Saranac Lake to the end of the lake where the Saranac River takes you to the Upper Locks. Paddle further down the Saranac River and you will be in Lower Saranac Lake. Pass Pope Bay, Pope Island and Picnic Point and head southeast into the Saranac River once more. You will travel through First Pond, go under Route 3 and then into Second Pond. The route then takes you on the Saranac River into the Lower Locks. After the locks the river widens into Oseetah Lake. You will pass Demerse, Winonah and Papoose Islands and Otter Slide which will be on your left. Follow the river into Lake Flower and the public boat launch in the Village of Saranac Lake. 1. Roadside Public Campgrounds - multiple campsites, drive-in convenience, fee charged, showers, usually some hook-ups and many have lakefront sites. Examples: Fish Creek Pond, Rollins Pond, Buck Pond, Meacham Lake. 2. Wild Forest Campgrounds - multiple campsites, boat access only, fee charged, some have amenities like an outhouse, picnic table or a fireplace with a grill. 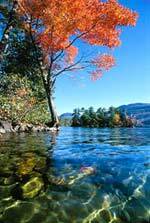 Examples: Lower and Middle Saranac Lakes. 3. Designated Campsites - no fee charged - may or may not have any amenities. Examples: St. Regis Canoe Area and Fish Creek Ponds Area. 4. Established Campsites - no fee charged, occasionally an outhouse or picnic table, fireplace may be an informal ring of stones. These fire rings should be used for open fires. Please do not remove them. 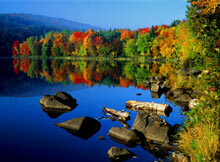 Examples: Raquette River, Paul Smiths Area and Lake Kushaqua Area, Tupper Lake. Offering amazing white water rafting trips all over the US and Canada! Search for the best white water deals from New York to California all over the web. Choose a trip for any age or ability level. Ideal for families, groups and solo travelers. America's experts in rafting bring you rafting trips on 44 of America's most fun rivers. Professional guides. Beginners to experts welcome. Using only state of the art equipment insuring a great adventure in the water. Large Groups welcome! Camping permits are required for: (1) any party of ten or more, or (2) any party remaining in the same location for four or more nights. You are responsible for obtaining your own camping permit before your arrival from the State Forest Ranger for the district in which you will enter state lands. New York State now requires that anyone bringing --paying clients-- onto state land must have a Guide�s License. Non-profit organizations are exempt. In accordance with state laws, (1) properly dispose of human wastes (burial at least 8- down and 150� away from water or camp), (2) help maintain water quality by not washing directly in the lake or stream, (3) cut only wood that is both dead and down and (4) carry out all you carry in. Boiling or treating drinking water is recommended. The greatest number of high peaks in the Adirondacks (in a single location) rise majestically in the Keene/Keene Valley Region making this area a meca for hikers, climbers and other visitors who wish to experience the remarkable beauty of the Adirondack mountains. There are literally hundreds of trail heads located in the tiny hamlet of Keene including the trail to the summit of Mt. Marcy, the highest mountain in New York State. This year the Annual Adirondack Mountaineering Festival will be held on Jan 18th - 19th in Keene Valley. The event is a celebration of mountaineering that includes a variety of ice climbing and mountaineering clinics. Everything you need to know to plan your trip online when visiting Upstate New York ... It's all right here at your fingertips...with just a click of your mouse! View thousands of local listings.